The Department of Defense has named Fort Benning's Fire and Emergency Services the Best Large Fire Department of the Year for 2014. This annual award recognizes the DOD's most outstanding large category fire departments for achieving the highest degree of excellence in mission support and fire protection management, according to the official congratulatory e-mail sent May 26 by Gerald A. Adams, chief of Fire and Emergency Services Branch at Installation Management Command at Fort Sam Houston, Texas. "I applaud Fort Benning achievements leading to this highly prestigious DOD award," Adams said. "Congratulations to Chief Timothy Seigal, his entire staff and firefighters for their outstanding accomplishment." To win this award, the department submitted a one-page document listing their achievements over the past year. The Fort Benning fire department is the DOD's sixth largest on an installation. The department protects the Ranger, Armor and Infantry missions, as well as more than 2,000 buildings and 4,000 housing units valued at $511 billion. Accomplishments in 2014 included saving lives - they deployed a special rescue team during a high-angle incident involving three parachutists stuck in 60-foot trees, and responded to a swift water rescue incident where they extracted seven personnel and had zero lives lost. The department also conducted 1,145 investigations to determine point of origin or cause and decreased false alarms by 27 percent, hosted a community National Fire Alarm and Signaling Code 72 course that prepped and instructed 26 students, saved $13,000 and enhanced DOD's renewable energy program by supporting three Green Projects, which reduced use by 10 percent. 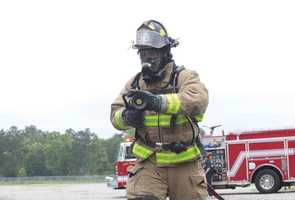 "It is an absolute honor for the Fort Benning Fire Department to be named the DOD's best," said Donald H. Savidge, Deputy Fire Chief of the Fort Benning Fire and Emergency Services. "Our department contains some of the most dedicated, professional firefighters serving anywhere in the country; it is truly a team award shared by every member of the organization. Fort Benning has an outstanding Directorate of Emergency Services and we are proud to protect and serve the members of this community." Fort Benning is a two-time winner of the Army and DOD awards, previously winning the award in 2011.